Web link to map available with itinerary. Centrally located just moments from the CBD of Nowra, away from traffic noise, adjacent to delightful Marriott Park, which is perfectly suited for weddings,and entertaining children of all ages. Ideal for the business traveller or short stays. 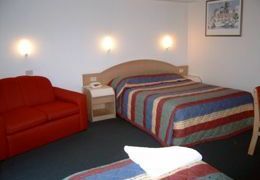 All rooms are no smoking and all rooms offer wireless internet connection. 30 rooms acc up to 80; Air-conditioning; Balcony; Bath; Clock Radio; Coffee/Tea Making; Cots; Credit Card Accepted; Electric Blankets; Ground Floor Accommodation; Hairdryer; Heating; DVD Players;Iron/Ironing Board; Laundry; Wireless Internet Access; Room Service; Swimming Pool; Telephone Direct Dial; Television Cable/Satellite; Video. Air-conditioned ground floor 4 star rooms with queen size bed and full single bed. Breakfast by menu can be delivered to rooms 7.00am to 8.30am at extra cost. First floor 4 star famliy deluxe room with 1 queen size bed and up to 2 full size single beds,sofa, breakfast is by menu and can be served to your room from 7.00am until 8.30am at extra cost. First floor 4 Star Deluxeroom with queen size bed and chivan bed. Breakfast is by menu and can be served to your room from 7am til 8.30 am at extra cost. First floor 4 star room with queen bed and pull out sofa. Breakfast by menu can be served to your room from 7.00am until 8.30am at extra cost. Ground floor 4 star room with queen bed and sofa. Breakfast is by menu and can be served to your room from 7.00am til 8.30am at extra cost. Ground floor 4 Star Deluxe rooms with queen sized bed and one full sized single bed & sofa bed. Breakfast is by menu and can be served to your room from 7.00am until 8.30am at extra cost. Ground floor 4 star room with single spa, queen size bed & sofa. Breakfast can be served to your room from 7.00am until 8.30am at extra cost. Ground floor 4 star room with kitchenette, single spa bath with a queen & single bed, also a single & sofa bed. Breakfast can be served to your room from 7.00am until 8.30am at extra charge. Ground floor 4 star room with double corner spa bath and queen size bed. A sofa and VCR are included. Breakfast can be served to your room from 7.00am until 8.30am at extra cost. All cancellations must be made prior to 10am the previous day OR a cancellation fee of $66 will apply per room per night.